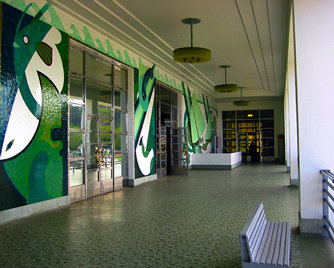 In 1939, Sargent Johnson undertook several more public art projects, including the WPA-sponsored renovation of the San Francisco Maritime Museum in Aquatic Park. There, he produced a mosaic mural, depicting marine life on the promenade deck facing the Bay, in various shades of green, black and white. 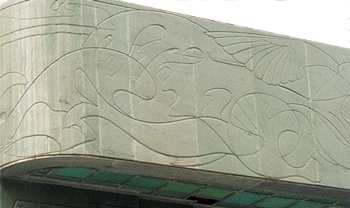 In the Streamline Modern style, Johnson also created an incised relief of green Vermont slate on the exterior entrance of museum, depicting men of the sea and marine life.